This is being equated by some to A Nation at Risk. This report may or may not have seismic potential though. We'll see. It costs $19.95 and may be purchased at this link. Check out here Jay Mathews' analysis of this report in the 12-26-06 issue of the WASHINGTON POST. Also check out this report by Lynn Olsn titled, "U.S. Urged to Reinvent Its Schools," appearing in the 12-20-06 issue of Ed Week. I agree that the most problematic recommendation is creating to tracks or classes of high s students at age 16. Low achievers (based on standardized test scores) would head to community college or trade schools while their higher achieving counterparts will go on a path toward selective colleges after finishing high school. Of course, we can already predict the types of students that would head in each direction as this will be correlated with race, class, and presumably gender. Re-stratifying our country according to these lines is no solution. Warning that Americans face a grave risk of losing their prosperity and high quality of life to better educated workers overseas, a panel of education, labor and other public policy experts yesterday proposed a far-reaching redesign of the United States education system that would include having schools operated by independent contractors and giving states, rather than local districts, control over school financing. The panel, the New Commission on the Skills of the American Workforce, included two former federal education secretaries, Rod Paige, a Republican, and Richard W. Riley, a Democrat; two former labor secretaries, William E. Brock, a Republican, and Ray Marshall, a Democrat; and an array of other luminaries, including former Gov. John Engler of Michigan, and the New York City schools chancellor, Joel I. Klein. The commission’s report, released at a news conference in Washington, rethinks American schooling from top to bottom, going beyond the achievement goals of the federal education law known as No Child Left Behind, and farther than many initiatives being pursued by the Bush administration or by experimental state and local school authorities. Among other things, the report proposes starting school for most children at age 3, and requiring all students to pass board exams to graduate from high school, which for many would end after 10th grade. Students could then go to a community or technical college, or spend two years preparing for selective colleges and universities. Mr. Spence, a former deputy schools chancellor in New York City, and other commission members acknowledged that enacting the proposals would be difficult, requiring legislation in all states and the cooperation of the federal government. Some, like one for merit pay for teachers, would require renegotiating teacher contracts nationwide and persuading local school boards to relinquish authority and take a new role enforcing performance contracts with schools. “You can’t implement something like this overnight,” said Mr. Klein, who had been scheduled to appear at yesterday’s news conference with Mayor Michael R. Bloomberg of New York, but whose flights were grounded by thick fog in Washington. Mr. Klein strongly applauded the commission’s proposals, and pointed to many efforts in New York — including sharp increases in teacher pay, a new master-teacher career step; increased roles for private groups in running public schools and performance agreements signed by 331 principals in exchange for greater freedom from superintendents — as examples of how some of the commission’s goals could begin to be accomplished. “We need to think big,” he said. The commission’s work was quickly hailed by some as a potentially groundbreaking document. “This report has the potential to change the debate on education at the national level,” said Jack Jennings, the president of the Center on Education Policy, who is a Democrat and prominent expert on the federal education law. The commission was organized by the National Center on Education and the Economy, a nonprofit, nonpartisan group based in Washington, and partly financed by the Bill and Melinda Gates foundation. The center organized a similar commission that issued a similar report 16 years ago. Marc S. Tucker, the group’s president, said globalization had created new urgency. “There is this growing mismatch between the demands of the economy and what our schools are supplying,” Mr. Tucker said. Paul Romer, an economist at Stanford University, said that some of the fears about competition with India and China might be overblown but that the education system still needed improvement. He said the current effort was driven by improvements in technology, much as advances in the early 20th century led to universal high school. State and union leaders debate beneficial changes to teacher contracts. In a move likely to raise the profile of teachers’ contracts as a force in school success or failure, education policymakers and union leaders came together here last week under the auspices of the National Governors Association for a mutual look at collective bargaining. The meeting largely lived up to its billing as a “new dialogue,” with civil expression of sometimes starkly different views about how the process should change to raise student achievement. The conference drew some 100 people representing nine states, for what organizers described as the first state-focused conversation on the topic between teachers’ union and education-agency leaders. “We’ve taken the first step in having a very public discussion and trying to figure out the state’s role in the discussion,” said Dane Linn, who heads the education division of the NGA’s Best Practices Center. The center hosted the Dec. 10-11 gathering along with Gov. Donald L. Carcieri of Rhode Island, several Rhode Island organizations, and the Annenberg Institute for School Reform and the Urban Education Policy Program at Brown University in nearby Providence. “It’s a little bit of a leap of faith to bring to fruition a conference like this, because the groups are often seen at loggerheads,” Gov. Carcieri, a Republican, said. Rhode Island’s Educational Partnership, a citizen and business group that was one of the meeting’s sponsors, stirred up local public interest in teacher contracts with reports this year and last comparing contract provisions from district to district. But the governor said it was in beginning to use an NGA grant for high school improvement that he saw problems with teacher-bargaining agreements. Given stiff global competition, especially from Asian nations, he said, the nation’s standard of living and its system of public schools will face unprecedented threats if students go unprepared. In a talk that kicked off the discussion, Andrew J. Rotherham, a co-director of the Washington-based research and policy group Education Sector, advised steering a course between those who contend unions are the “root cause” of underachievement and those who maintain they have nothing to do with it. The problem, he argued, is much more that teachers’ unions have grown conservative and, like other educational institutions, have failed to keep up with the escalating demands on schools. They can be protective of teachers’ rights at the expense of teachers’ opportunities and, worse, student achievement, especially for the most disadvantaged children, said Mr. Rotherham, who was an education adviser to President Clinton. “I’d argue [the unions are] not living up to their promise as the powerful, tectonic institutions they are,” he said, allowing for some exceptions such as the United Federation of Teachers’ two charter schools in New York City and a new pay plan for teachers crafted in part by the Denver Classroom Teachers Association. To help end collective bargaining that deals an unfair hand to students, Mr. Rotherham called for greater openness about the contracts and participation by more groups in framing them. In a discussion that took on state law as a context for bargaining, the panelists split sharply over whether the “scope of bargaining,” a matter generally set by the state, should be broad or narrow. Alan D. Bersin, who recently stepped down as the California secretary of education and formerly headed the San Diego schools, said that teachers aren’t necessarily ready to set the agenda for reform. But Randi Weingarten, the president of the New York City teachers’ union, said that as the most important “agents” for raising student achievement, teachers are a fundamental part of any school improvement equation. 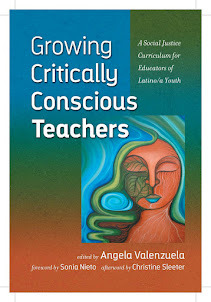 The alternative to teacher participation in setting policy for curriculum and instruction is, at best, she said, a mentality of compliance with rules as opposed to responsibility for results. The two even disagreed, calmly, over where power lay. Mr. Bersin held that the union is “the most powerful institution in the sector, and yet they constantly feel under seige.” Ms. Weingarten countered that the union is the “secondary player” because it can block but generally not implement changes. “Management has far more power to say ‘yes’ than we do,” she said. In a presentation, he said that to make the deal in Denver, which required school board, union, and voter support, the union and the district had initially agreed only “to say ‘maybe’ together” with a plan for researching and devising a new system. “We pushed the envelope of collective bargaining,” said Mr. Jupp, who before he began working as an adviser to the Denver superintendent was a member of the National Education Association. Although the American Federation of Teachers was well represented among the presenters, Mr. Jupp was the only speaker with an NEA connection. Organizers said NEA officials had been “equally invited” to make presentations. A spokeswoman for the union suggested that its top officers might have been busy with governance meetings. But Steven F. Smith, the president of the Providence, R.I., teachers’ union, pronounced himself satisfied. He said he had feared that the gathering would focus on changing collective bargaining laws. "On average, states and local governments spend $825 less per student in districts educating the poorest students compared with what is spent in the wealthiest school districts." Kennedy wants to re-consider funding, though, in order to address the imbalances. WASHINGTON (AP) -- Poor students are shortchanged by federal and state school aid policies, a report released Wednesday says. At the federal level, the Education Department gives states nearly $13 billion a year to help students in low-income districts. The complex formula used to determine each state's share guarantees a minimum amount for small states. That means Wyoming and Vermont, for example, can get more money per poor student than do more populous states. Federal school dollars also are tied to the amount that each state spends on education. States that spend more get more from Washington. But this link rewards states more for their wealth than their efforts to educate poor kids, according to the Education Trust, a Washington-based children's advocacy group. For example, the report shows Maryland has fewer poor children than Arkansas but gets about 50 percent more federal aid per poor child, $1,522, than does Arkansas, at $1,009. The gap occurs even though Arkansas dedicates a larger share of its resources to education than does wealthier Maryland, the report says. The authors say that when Congress reviews federal education spending in the coming year, lawmakers should rethink how they distribute funds for poor students. ''The least needy states get the most, and the most needy states get the least. That's perverse,'' said Goodwin Liu, an assistant law professor at the University of California at Berkeley and one of the report's authors. Liu acknowledges it could be politically difficult to change the formula for distributing funds if those changes lead to cuts for some states. But there is some recent precedent for doing so. When the No Child Left Behind education law was passed in 2001, lawmakers put in a provision that targeted more federal aid to schools with high concentrations of poor children. Sen. Edward Kennedy, D-Mass., the incoming chairman of the committee that oversees education policy, is showing a willingness to re-examine how school aid is distributed. Like the government, states also are failing to allocate their own school dollars in a way that targets the neediest students, the report says. In more than half the states, school districts with high poverty rates get less in state and local money than wealthy districts, according to the report. It found that on average, states and local governments spend $825 less per student in districts educating the poorest students compared with what is spent in the wealthiest school districts. The biggest gaps in funding between poor and wealthy districts occur in Illinois, New Hampshire, New York and Pennsylvania. In contrast, Massachusetts and Kentucky were singled out for targeting more money to high-poverty districts and for having measures to ensure the money is used to boost student achievement. The report also highlights funding gaps within school districts, which often result from differences in how salaries are distributed. In general, wealthier schools have more senior, higher-paid teachers. For example in Austin, Texas -- a city with one of the largest salary gaps -- the average teacher salary at the poorest school is $3,837 less than the average teacher salary at the wealthiest school, the study found. access to a college or university. in two-year or vocational programs. level have also influenced the awarding of the grants. The 1980s and 90s, however, were a different story. heavily on moderate income college students. purchasing far below its peak in the 1970s. top 20% of incomes receive 80% of college degrees. of incomes will get only 5% of the college degrees. and lack of a college degree is one of the reasons. both their lives and the economy. Pat Williams served nine terms as a U.S.
the Center for the Rocky Mountain West. Click here to get Full report (PDF format, 440KB). Cambridge, MA — December 21, 2006 — Data from a survey of over 1,000 teachers in K-12 public schools across the country show that our teaching force — like public school students — is largely segregated. Teachers of different races are teaching students of very different racial composition, adding an extra dimension to growing student racial segregation. The Civil Rights Project’s research has consistently documented the growing segregation of American public school students. Understanding racial equity in schools requires that we understand who the teachers are, whether they are products of segregated schools, what kind of schools they work in, and how faculty racial patterns relate to student segregation. There is a great deal of discussion but little systematic national evidence on the racial experiences and attitudes of teachers. This unique national survey offers us a chance to explore those issues in this and forthcoming reports. The findings make clear that there is a need for policies focused on diversifying the teaching force and ensuring that schools serving students of all backgrounds have a racially integrated, highly qualified faculty. Creating schools with integrated faculties will help prepare students for living and working in our racially diverse society, including giving our nation's future teachers early, important experiences with diversity. Erica Frankenberg, M.Ed., is a Research Assistant at The Civil Rights Project. She is a doctoral candidate in education policy at the Harvard Graduate School of Education, where her research focuses on school desegregation. Recent publications include "The Impact of School Segregation on Residential Housing Patterns: Mobile, AL and Charlotte, NC," in School Resegregation: Must the South Turn Back?. She is also co-author of a series of reports on desegregation trends. She is the co-editor of Lessons in Integration: Realizing the Promise of Racial Diversity in America’s Schools (with Gary Orfield, 2007 from University of Virginia Press). among researchers nationwide, and wide open doors among advocacy organizations, policymakers, and journalists. Focusing initially on education reform, it has convened dozens of national conferences and roundtables; commissioned over 400 new research and policy studies; produced major reports on desegregation, student diversity, school discipline, special education, dropouts, and Title I programs; and published ten books, with four more in the editing stage. Note: The Civil Rights Project will move to UCLA in mid-2007. Copyright © 2002 by The President and Fellows of Harvard College. Sen.-elect Claire McCaskill wants the U.S. government to ramp up security by building a new border fence, avoid giving undocumented immigrants a chance for legalization, punish employers that hire them, and resist business-lobby pressures to create a temporary guest worker program for foreigners. Meet the incoming senator from Missouri, representing the Democratic Party's new face on immigration and border security. She defeated an incumbent Republican not known for his tenderness toward undocumented migrants. As the new Democratic-led Congress prepares for its session in January, prospects for changes in immigration laws remain unknown: The matter is not on the top-priority list of Democratic leaders. The enforcement-only view championed by McCaskill and other newcomers could create a rift within party ranks, akin to the chasm the issue opened among Republicans last year. Democratic leaders have vowed to introduce legislation to improve ethical conduct in Washington, raise the minimum wage and cut student loan interest rates ˜ but immigration isn't on their initial agenda. The issue is too thorny for a quick fix, said Drew Hammill, spokesman for Nancy Pelosi, the incoming House speaker. "Immigration is absolutely a top priority for her, and she has talked to the president about it," Hammill said. "But it's complex, and she'll want to go through committees and hearings." A leading national immigration analyst said last week that immigration legislation is expected to be introduced in March or April. But if people think a Democratic-led Congress will be able to easily break the legislative impasse seen under Republican control this year, they'd better think again, said Tamar Jacoby, who follows immigration issues for the Manhattan Institute, a conservative New York City think tank. The public isn't expecting much: Forty percent of respondents in a Rasmussen poll last week didn't expect to see immigration reform enacted. Still, immigration advocates remain optimistic that last year's gridlock won't be repeated. "Most disagreements are on the edges now, such as on working out acceptable numbers of visas and guest workers allowed," said Michelle Waslin, spokeswoman for the National Council of La Raza. Opponents of illegal immigration lamented losing some big-name supporters of their cause in the election. This came out earlier. Most kids don't take care of transfer options suggesting the limitations of so-called "choice." AUSTIN – The ranks of low-rated public schools swelled again this year under Texas' education choice law, giving hundreds of thousands of students at the state's worst campuses the right to transfer to a better school – though few are expected to do so. The Texas Education Agency identified 924 campuses across the state Monday where students will be able to bail out and enroll at another public school if their parents wish. The total was up 12.5 percent from a year ago and constitutes about 12 percent of the state's schools. The Dallas Independent School District had the second-most campuses at 78, one more than last year. District officials could not be reached for comment. Houston had 112 schools, and Fort Worth had 30. The Public Education Grant program allows for students to transfer, but the state provides no funding for transportation to a new school, and districts aren't required to provide busing. Only 321 students exercised their option to move last year, education agency officials said Monday. Since the program began in the late 1990s, fewer than 2,500 students have used it to transfer to a new school. That issue, though, could be up for review by the Legislature. The Senate Education Committee, in a report this month, called on lawmakers to explore transportation funding. Officials have said the lack of transportation is one of the biggest obstacles for students and parents interested in another school. The report did not address what that might cost. The program may also play a prominent role in the debate on private-school vouchers expected in the upcoming legislative session. Schools on the transfer list would be primary candidates for a pilot voucher plan or another school choice program, and Republican leaders may argue that with the number of failing schools continuing to rise, parents need new options. Voucher opponents, though, say that removing students and funding from public schools will make it harder to fix them. The number of low-performing schools on the list has jumped significantly three years in a row. Three years ago, just 126 schools were eligible for the grant program. State education officials attributed the large increase to tougher performance standards that have been used to rate schools in recent years, particularly in science and math. "Science and math continue to be a challenge for schools across the state," said TEA spokeswoman Suzanne Marchman. More students had to pass both subjects on the Texas Assessment of Knowledge and Skills for a school to be rated acceptable. Even though the passing standards were not demanding this year – requiring at least 35 percent of each student group to pass in science and 40 percent in math – those percentages were up from the previous year. "It looks like science was the larger hurdle for schools to clear, and that is a key reason we saw more schools on the list this year," Ms. Marchman said, noting that passing standards will climb again next year. "As the passing standards continue to increase, it is very likely we will see the number of schools on the list increase as well," she added. The names of eligible schools are being published now because most districts consider transfer requests several months before the start of each school year. Parents must be notified of the option by Feb. 1, with students allowed to enroll at a new school for the next fall. Students can transfer to another public school in their own district or another district – if that district agrees to accept them. Those that do enroll students under the program receive a financial incentive from the state – an extra 10 percent in funding per pupil. That financial incentive has not been enough to spur participation in the program, particularly when no transportation funding has been available. In addition, school districts are not required to accept transfer students from neighboring districts. On Monday, officials didn't say exactly how many students will have the transfer option, but as many as 600,000 students may be enrolled at the 924 campuses. Other school districts in the Dallas area that had campuses on the list were Arlington, Birdville, Cedar Hill, Denton, DeSoto, Garland, Grand Prairie, Hurst-Euless-Bedford, Irving, Lancaster, Lewisville, Mesquite and Richardson. Schools on the list had to have more than 50 percent of their students fail the TAKS in two of the last three years or have had an "academically unacceptable" rating in any one of the last three years. Other than transportation concerns, education officials also cite other reasons for low participation, including the many school options that students already have. Among those are independent charter schools, magnet schools and open enrollment schools in many districts that accept students who live anywhere within the district. Low-rated charter schools are not included on the list because students attend those campuses voluntarily and may transfer back to their home district at any time. Students can transfer out of any school where more than half the students failed the TAKS test in any two of the last three years or where the school was rated academically unacceptable any of the last three years. Students can move to another school in the district or to another district if the district accepts them. Parents must be notified of the right to switch by Feb. 1. Transfers take effect the next fall. Consider providing money for school districts to transport to different campuses those students who want to leave bad schools. Allow parents to consider choosing a different school more quickly, even in the same academic year. SOURCE: Dallas Morning News research© 2006 The Dallas Morning News Co. Since we continue to read alarmist stories about rising tuition and the affordability of a UT System education, we hope you will permit us to offer a few facts regarding tuition at University of Texas institutions. We work hard to keep the cost of education as low as possible. In fact, total revenue per student adjusted for inflation has remained relatively flat. Between 2002 and 2005, revenues per student increased by just $229 — from $12,728 to $12,957 — or 1.8%. The actual cost of producing a semester credit hour is not out of control; we are not seeing annual double-digit increases, as in the case of health care. But the price charged to students has risen significantly. Like state legislatures across the country, the Texas Legislature is confronted with competing priorities amid rising costs for many vital services including public schools and health and human services. As a consequence, over the past four years, state support for UT academic institutions has been fairly consistent, but enrollment growth and inflation have eroded the share of costs the state covers. And it is fair to say that students have made up most of the difference. In round figures, the state share of funding has gone down $1,000 per student and tuition has gone up $900. Though students and their families are picking up more of the tab, a college education at a UT institution remains affordable. About half of our undergraduate students receive financial aid. As has been the case in every tuition-setting process, we set aside funds for student financial aid — more than the 20 percent required by law. Many students of moderate means will pay little or none of their tuition increases. The average student gets more than a 30 percent discount from the sticker price. Professor Bridget Terry Long of the Harvard Graduate School of Education describes what she calls the "list" tuition price — as it appears in college catalogs — and the "net" tuition price — the average price actually paid by students once scholastic grants are factored in. She invokes College Board figures to show that from 1996-97 to 2006-07, at public four-year colleges across the nation, the average list price (tuition and fees) increased 49 percent, but net price increased only 29 percent. That certainly reflects our experience in Texas. And it reflects general trends in inflation. To help students and their families calculate the net price, we established www.texascollegemoney.org, which allows Texans to determine costs, find available financial assistance and seek additional financial aid counseling. With the advent of tuition flexibility, we have been able to establish incentives for students to graduate in a timely fashion. Our campuses are using innovative approaches such as flat-rate tuition, tuition rebates, discounted tuition for courses offered at off-peak hours and guaranteed tuition rates for a set period of time to encourage students to take more credits each semester and graduate within four years. Graduating on time saves students far more than they pay in tuition increases. Taking longer to get a degree costs students and their families in two ways: extra tuition and the opportunity cost of not moving into the work force. Besides, UT institutions are still great values. According to the federal Department of Education, among the 10 most populous states, the total price of attendance and tuition and fees at Texas four-year public institutions continues to rank among the lowest. And all UT System academic institutions have tuition levels well below the average for top-tier public institutions in the 10 most populous states. UT-Austin ranks 7th out of the 10. Finally, a college education is still the best investment for students and for Texas. College graduates in the United States earn nearly twice as much as their peers with only a high school diploma. Even if students must borrow to attend, as graduates their higher income makes their loans easier to repay. Education, like all investments, should be evaluated on the basis of anticipated return. By that standard, it's a solid investment for everyone. Yudof is chancellor of The University of Texas System. Recommendations include creation of a powerful new oversight agency and an increase in financial aid. A panel that advises Gov. Rick Perry is calling for the creation of a new and powerful entity to oversee higher education along with an increase in financial aid for students from low-income families and mandatory testing to measure achievement and learning in college. The latest draft of a report by the Governor's Business Council also recommends giving the state's two public flagship campuses, the University of Texas at Austin and Texas A&M University at College Station, more independence to focus on research and graduate education. It says greater restraints should be imposed on other campuses that aspire to become research universities without the essential private sector and regional support. The recommendations are certain to be controversial among lawmakers and higher education leaders, particularly one calling for a new entity, organized as a public corporation, to replace the Texas Higher Education Coordinating Board. The Texas Higher Education Board proposed by the business council would have greater authority, responsibility and stature. It would be the final authority on the creation of new campuses and the addition of new degree programs, and it would be in charge of developing a long-range financing plan to achieve statewide educational goals. The Legislature historically has played a strong role in such matters, but the report concludes that it is necessary to insulate policymaking from "institutional, regional or political pressures." The report emerged from a review that began more than a year ago at Perry's request. Despite its name, the Governor's Business Council is not an arm of the governor's office. Rather, it is a nonprofit organization of the state's top business executives, but governors from both political parties have sought its advice for years. It's not clear which, if any, recommendations Perry might endorse. Members of his staff, as well as the governor himself, have said in recent weeks that he is working on a higher education initiative for the legislative session that begins next month. "We need to look at ways to make higher ed more affordable, more accessible, more efficient," Perry told the Austin American-Statesman last month. Kathy Walt, his special assistant for communications, said the governor's interests include securing greater transparency in higher education budgets. "He'll be laying out some higher ed issues in coming weeks that go to issues of accessibility and affordability," Walt said. "We're going to let the governor make his announcement when he's ready to." The governor might do so during his state-of-the-state address in February, she said. Some of the business council's recommendations echo themes in a report issued earlier this year by a panel advising U.S. Education Secretary Margaret Spellings. That panel, led by Houston investor Charles Miller, a former chairman of the UT System regents, called for, among other things, testing of students to assess their intellectual gains during college and greater transparency about colleges' spending practices. The business council paints a grim picture of the state's future if current trends are not reversed: a less-educated population, a decline in per capita income and reduced tax revenues. "Our education pipeline is leaking badly. Only 13 percent of Texas ninth-graders graduate with a degree or certificate nine years later," the report concludes. "It is time for Texas to take a hard look at our system of higher education." Such warnings aren't new, but noteworthy is that an influential organization of business leaders has taken them to heart. Studies by the coordinating board have shown that, although college enrollment is increasing, Hispanics aren't keeping up. Because Hispanics are the fastest-growing population group in Texas, that trend is worrisome. One factor in lagging enrollment and graduate rates could be a shortfall in financial aid. More than 70,000 students eligible for a Texas Grant aren't getting one because full funding would require nearly twice the $332 million allotted to the program in the current two-year budget, according to the coordinating board. The business council did not specify how much financial aid should increase. The council's report focuses on public colleges and universities because only about 10 percent of the 1.2 million students enrolled in postsecondary education in Texas attend private institutions, said Woody Hunt, a former UT System regent who chairs the council's committee on higher education. Hunt said the council hired the National Center for Higher Education Management Systems, a nonprofit organization in Boulder, Colo., to help prepare the report. "We're waiting for the governor's response to the report," Hunt said. "I think there's a very compelling case that some change is necessary." •Enact legislation, dubbed "the Texas Compact," to establish long-term goals for educating students to globally competitive levels and building top-quality universities. •Replace the Texas Higher Education Coordinating Board with a new entity organized as a public corporation and given authority, responsibility and status to pursue long-range plans despite regional and political pressures. •Increase funding for Texas Grants, the main state-funded financial aid program. •Require public colleges and universities to measure their students' achievement and improvement over time and to be more transparent about costs and other operational matters. •Free the University of Texas at Austin and Texas A&M University at College Station from some state and university system constraints to increase their focus on research and graduate education. •Emphasize, through state appropriations and other mechanisms, the undergraduate teaching mission of most of the state's four-year public schools. rhaurwitz@statesman.com; 445-3604. Additional material from staff writer W. Gardner Selby. •No one knows for sure, but it's reasonable to say that 120,000 cq to 160,000 cq of the population gain is Hurricane Katrina related, said state demographer Steve Murdock cq. 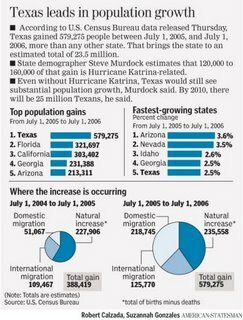 •But with or without Hurricane Katrina, Texas would see a substantial population growth, Murdock said. By 2010 cq, there will be 25 million cq Texans, he said. High-performing students who grew up in Georgia but are undocumented immigrants soon won’t qualify for discounted tuition at state colleges. The change is necessary to comply with the state’s aggressive new immigration laws, which went into effect in July, says Burns Newsome, attorney for the Georgia Board of Regents. The new policy means students who have high grades but are in the country illegally will have to pay the much higher out-of-state tuition rates rather than being allowed to pay in-state tuition. Sen. Chip Rogers, R-Woodstock, architect of the tough immigration laws, says the state should not subsidize the education of students who won’t be able to work legally after graduation. The policy shift also wards off any potential lawsuits, which have plagued states like California and New York, he says. “Georgia doesn’t need to be put through that,” Rogers says. But others say the change will only hurt communities where high school dropout rates are high and college attendance rates are paltry at best. It is unclear how many students will be affected because the regents don’t track the number of illegal immigrants at state colleges. This year, in-state students pay $1,819 per semester to attend Georgia State University, compared to the $7,276 per semester that out-of-state students pay. Ten states offer in-state tuition to illegal immigrants, according to the National Council of La Raza. Many of those states have faced lawsuits from U.S. citizens paying out-of-state tuition rates. The American-Statesman's Juan Castillo recently reported on a private prison in Williamson County where families of illegal immigrants are held to await disposition of their cases. It is one of two Immigration and Customs Enforcement facilities in the United States holding non-Mexican unauthorized immigrants on noncriminal charges. The backlog is so strained that U.S. Attorney General Alberto Gonzalez, the grandson of Mexican immigrants, noted: "The department and the federal courts are straining under the weight of an immigration litigation system that is broken. Under the current system, criminal aliens generally receive more opportunities for judicial review of their removal orders than noncriminal aliens." Nothing will change until reforms are initiated, and Congress has done little to fix a broken immigration policy and the machinery to enforce it. The result is the private prison facility in Taylor and a smaller one in Pennsylvania. For reasons of security and the law, a close watch on the nation's borders is warranted. But what isn't acceptable is jailing mothers and children awaiting a hearing on their status. Perspectives / Happiness Vs. Achievement? Countries that embrace self-esteem, joy, and real-world relevance in learning mathematics are lagging behind others that don't promote self-regard and relevance to the same degree, the Washington Post reports, describing findings of the Brookings Institution's recent comparative study of 8th graders in the TIMSS study (2006). Because U.S. students report higher self-confidence but lower math scores than do their counterparts in Japan, Korea, and Singapore, the researchers conclude that U.S. schools overestimate the importance of student happiness. All this makes me wonder about the limitations of correlative research. In their haste to make competitiveness trump the pursuit of happiness, the researchers stoke another U.S.-centric debate between traditionalists and progressives. Wouldn't it be better if they would use their research to help educators figure out how to produce students who are both confident and competent, creative and knowledgeable? Shore up teacher knowledge. The need for science teachers who not only have a firm grasp of content but also know how to teach students is enormous. Simply requiring candidates to major in science or attracting former scientists to work in schools are partial answers at best, our authors tell us (pp. 16, 24). Generalist teachers who teach science now or who will be assigned to teach science in the near future need both professional development and support to apply their new learning in the classroom (pp. 24, 72, 80). Streamline the content. National science standards contain far too many concepts, writes Gerald F. Wheeler (p. 30). More science content is not necessarily better science content. Make assessment mean something. Researchers have found that feedback that focuses on the person and not on the task can actually cause decline in performance, Jacqueline Clymer and Dylan Wiliam tell us (p. 16). In addition, grades should account for cumulative achievement rather than aptitude, thereby informing students that “smart is not something you are--it's something you become." Clymer and Wiliam describe standards-based assessment that supports the teacher to improve learning rather than just measure it. Share best practices. Kathleen Roth and Helen Garnier (p. 16) describe contrasting practices in five countries in the TIMSS study. Whereas teachers in the Czech Republic publicly quiz students on multiple concepts, Japanese teachers develop a few ideas in depth. Whereas the Japanese teachers lead students to discover evidence in experiments, the Dutch hold students responsible for learning from textbooks. U.S. teachers discuss real-life issues with their students, but, unlike the Australians, they often fail to connect such issues to curriculum concepts. The authors recommend building science lessons sequentially and linking hands-on inquiry to the development of science content understandings. Should one country discard its practices in favor of another's? Such a task might be impossible, given that "all teaching is a cultural activity." But certainly we can learn from one another—and must, if we want more budding--and I hope, happy--scientists in our world. Li, J. (2006, April 26). Not ready for science tests. Education Week, p. 40. Mathews, J. (2006, Oct. 18). For math students, self esteem might not equal high scores. Washington Post, p. A02. © Copyright ASCD. All rights reserved. Texas lawmakers approved public charter schools in 1995 to increase options for parents, attract new teachers to public schools, create competition for public schools and encourage innovative learning methods. • Admission must be open to all students — except in some cases, including those with documented criminal histories or discipline problems. Charters are not allowed to charge tuition. • Today, 192 charter holders operate 358 campuses in Texas. Current legislation limits the number of charters that can be issued by the State Board of Education to 215. When Texas opened its first charter schools a decade ago, some public school educators feared that the radical new option would lure away the best and brightest students from traditional public schools. Ten years and 358 charter campuses later, that fear hasn't been realized. Rather, most of Texas' charters — free public schools that don't have to comply with some state regulations — are catering to poor and minority students at risk of dropping out. The dramatic shift in the target audience hasn't been the only surprise in Texas' charter school experiment. Policy-makers have found it nearly impossible to close struggling campuses, including Houston's Gulf Shores Academy. On the other hand, even skeptics applaud the successes of some charters, such as the Houston-based Knowledge Is Power Program and YES Prep Public Schools. For the movement to become a truly competitive force in public education, charter school reform must be a top issue in the legislative session that starts in January, experts said. "We have to reward really good charters, and we need to close those schools that are not meeting the needs of the students," said Senate Education Chairwoman Florence Shapiro, R-Plano. A bill to be introduced this session would pull the plug on every Texas charter school in the fall and then instantly reopen the strong campuses with perpetual licenses, said Rep. Rob Eissler, R-The Woodlands. The move could close 20 to 30 underperforming schools, officials said. "It kind of starts everything with a clean slate," Eissler said. "The debate will be interesting, and the results will be interesting." Despite the political attention it garners, Texas' charter school movement is still in its infancy. About 90,000 of Texas' 4.5 million public students attend state- or district-approved charter schools, just 2 percent of the student population. Even with a state-mandated charter cap, enrollment is growing by a robust 10 percent a year. In the Houston area, charters may have a market share as high as 15 percent, said Todd Ziebarth, a researcher with the National Alliance for Public Charter Schools. HISD officials estimate that 12,000 to 13,000 children who live inside district boundaries attend state-approved charter schools. Another 10,000 or so attend HISD charter schools. However, the disparity in the quality of education those children receive is wide. Texas charter schools are more likely than traditional public schools to earn state ratings at the very top and the very bottom of the scale. This August, nearly 16 percent of Texas charter systems were deemed "unacceptable," compared with just 3 percent of traditional districts. Just 1.3 percent of traditional districts earned "exemplary" ratings, compared with 3 percent of charter systems. A handful of charters made headlines for serious financial and academic concerns. Three former employees of the defunct Prepared Table Charter School in Houston were sentenced to prison last year for helping defraud the government of $6 million. The Gulf Shores Academy and Alphonso Crutch charter schools have owed the state as much as $10.6 million and $1.6 million, respectively. "The biggest problem that the high-performing charters have is perception, and the perception the citizens of Texas have is of low-performing charters," said John Pitts, a Houston lobbyist who represents two charter school coalitions. Marquette University professor Howard Fuller, chairman of the Black Alliance for Educational Options, told more than 650 people at a charter school conference in Houston last month that charter operators must be their own toughest critics. They can't make excuses for failing to educate their poor and minority students. "That's why charter schools were created — because we said, 'It's hard, but we can do it,' " Fuller said. "Now that you are there, you can't be whining and crying about how hard it is. It's supposed to be hard." Charter schools that aren't preparing students for college should be closed, he said. "You cannot be committed to charter schools," Fuller said. "You have to be committed to the students who come to charter schools." 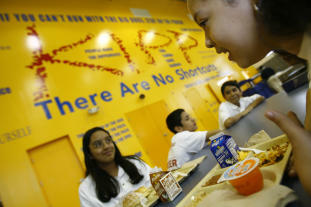 More than 1,000 students are waiting for spots in KIPP's southwest Houston schools. The multischool campus houses KIPP Academy Middle School, one of Texas' oldest charters. With 52 schools nationally, KIPP has produced results by extending the schoolday, holding Saturday classes, mandating parental involvement and fostering a culture of high expectations among its low-income students. College pennants line the walls, and the names of the former KIPP students who now attend those universities are proudly listed underneath. The philosophical differences are not lost on students new to the school this year. "At my old school, they didn't care if we went to college," said Guillermo Vizcardo, a 10-year-old who attended Petrosky Elementary in Alief last year. Former HISD student Ivan Sepulveda, 10, added: "This school teaches more about life — how we can get a good job and what to expect." Even with his school's popularity, KIPP co-founder Mike Feinberg said he knows the charter movement hasn't rattled traditional schools. "We're not there yet. We're not even close," he said, adding the state must shut low-performing schools before the movement can really take root. Three students are waiting for each seat at Harmony Science Academy, a charter system that consistently earns an "exemplary" state rating. Still, Harmony Superintendent Soner Tarim acknowledges they're not big enough to scare traditional schools. "In Houston, it's difficult to see the impact charter schools are having," he said. Nearby, native-Spanish-speaking students at SER-Niños Charter School alternate weekly between English and Spanish lessons in the school's innovative dual-language program. The little-publicized campus operated from a church before gaining the wherewithal to finance a $5 million building. "We fly under the radar," said Charmaine Constantine, who runs the school. Still, SER-Niños is wildly popular. Even though students are selected through a lottery, parents lined up at the crack of dawn to hand-deliver their applications this school year. "We had like 50 applications in the first two hours," Constantine said, adding that the waiting list is 188 students long. Though Constantine measures her campus' scores to those of neighboring schools, HISD Superintendent Abelardo Saavedra said he doesn't view charters as competition. "You don't have enough success with charters yet," he said. "In the state of Texas, at least, there's been more failures than successes with the charters." Patsy O'Neill, executive director of the Resource Center for Charter Schools, however, credits the state's strongest charters with putting reforms such as school uniforms, International Baccalaureate and a college-prep focus on the radar of traditional public schools. Educators took notice, for instance, when YES College Prep started requiring students to earn college admission before receiving their high school diplomas. Just this year, the Houston Independent School District released a draft college-going plan that asks all high schoolers to fill out a Texas college application prior to graduation. "The competition from YES and KIPP in Houston have probably made the HISD and other traditional districts in Houston look harder at academics," O'Neill said. Others say that charters haven't lived up to their billing as innovative alternatives. "That's been the problems with charter schools — very, very few of them have offered anything unique other than their privatized management. Most of them are structured like our neighborhood schools, they're just not doing as good of a job," said John O'Sullivan, secretary for the Texas Federation of Teachers. Though he supports charters, he says they don't deserve credit for reforming traditional schools. "It's a little bit irritating. Texas public schools have been on an upward curve in terms of improving student achievement for 20 years, well before the advent of charter schools," he said. "It's a little boisterous, I'd say, for charter schools to be claiming credit for our successes. I think they need to focus on their own success, or lack thereof." Since Minnesota penned the nation's first charter school law in 1991, the movement has attracted 1.1 million children throughout the U.S. While especially active in Washington D.C., Chicago and New Orleans, charters are just starting to gain steam in many areas. It took California's movement — the second-oldest in the country — 10 years to get its footing. The state's 600 charter campuses serve nearly 220,000 students. "Between years 10 and 15, we've really seen a maturation in the movement," said Gary Larson, vice president of the California Charter Schools Association, who predicts that the Texas' movement will experience the same success in the next five years. Finally, Larson said, public schools in Oakland and Los Angeles are starting to respond to the increased market pressure. Strong charters should not be seen as a threat, he said. "We need to prioritize the real threats, like dropouts and illiteracy," Larson said. San Antonio Express-News writer Gary Scharrer contributed to this report. The Austin Independent School District considers Oak Hill Elementary teacher Carolina Duncan to be one of its best bilingual teachers. Duncan trains other teachers and said her efforts show on the TAKS test and on her students' overall success. they read at second or third grade level," Duncan said. But not all Texas bilingual teachers can count the same successes. That's part of the reason why the Mexican American Legal Defense and Educational Fund (MALDEF) is suing the state. It names the Texas Education Agency (TEA) and the State Board of Education as defendants. "English language learners are failing. They're being retained in the grade levels and they're being eventually pushed out of the schools that are meant to educate them. And the state isn't doing anything about it," David Hinojosa of MALDEF said. "The state has retracted on many of of its monitoring obligations. You know, the Legislature used to require on-site monitoring and now on-site monitoring is done very minimally," he said. Education Agency that show large gaps between students in bilingual programs and their peers. The passing gap widens beginning in fifth grade. Duncan said that will not happen with her students. She expects them to do well in middle school and in high school. chills. I love it," she said. learning is happening in every bilingual classroom. The Attorney General's office represents the state in this case and declined to interview. Education seen as key to chance for moving out of lowest income groups. Among Americans’ most cherished beliefs is the idea that the United States is a land of opportunity, a place where all children have an equal shot at success regardless of the circumstances of their birth. A growing body of research suggests, however, that idea may be a myth. Going from rags to riches in this country, some studies conducted over the past 10 to 15 years say, may be harder than it used to be. In fact, newer international studies suggest that children born into poor families in the United States have a smaller chance of rising out of poverty than their counterparts in many other industrialized nations. Given those bleak assessments, some analysts say that education—perhaps now more than ever—is critical to breaking or perpetuating that intergenerational cycle. Ms. Sawhill edited a volume of papers published by Brookings last month that explores education’s potential for increasing intergenerational mobility. Focusing public attention on that issue is particularly important now, she said, because statistics show that the income gap between America’s poorest and richest citizens has widened since the 1980s. Experts differ, though, over how much social mobility has changed in the United States. Some contend opportunities to get ahead were more plentiful in the 19th century, when frontier land was still widely available. The Brookings scholars say opportunities to move forward—or fall behind—remained high for much of the next century but appeared to diminish in the 1980s. Other scholars contend that the nation may never have been as open a society as it was believed to be. There is more consensus around the idea that the United States has no unique claim, among nations, as a land of opportunity. Measured in terms of income, studies over the past two or three years have shown, the nation offers less opportunity for upward or downward mobility than Britain, Canada, Denmark, Finland, Norway, Sweden, and possibly Germany. In terms of occupational mobility, the United States remains around the middle of pack, according to the Brookings report. These data, showing intergenerational wealth from 1979 to 2000, illustrate that there is less mobility for people who start out in life in the poorest and richest groups of Americans. A study released in January by the Institute for the Study of Labor, a research group based in Bonn, Germany, suggests one reason for the United States’ poor showing. While wealth begets wealth in most countries, the United States is different in that there is “stickiness” across generations at both ends of the income scale. Compared with other industrialized nations, such as the Scandinavian countries, relatively smaller proportions of poor American children ever rise out of poverty, those scholars say. In the new Brookings volume, “Opportunity in America: The Role of Education,” the writers contend that opportunities to break those persistent economic cycles exist across the education spectrum—in preschool, in K-12 schools, and in higher education. The problem, though, is that education systems operate in some ways that can reinforce the gaps between the haves and have-nots. During early childhood, for instance, children from wealthier families are still more likely than poor children to attend preschool, and more likely to attend a better-quality preschool, the Brookings authors say. That is true, they add, even though more than half of poor 3- and 4-year-olds now attend some form of preschool. Likewise, school districts in poorer areas spend on average about the same per pupil as wealthier districts do, according to another essay. Yet disadvantaged children are more likely to attend elementary and secondary school in buildings with fewer certified or experienced teachers, less adequate facilities, and fewer Advanced Placement courses than is the case in the schools that more advantaged children attend. Children from lower socioeconomic backgrounds are also more likely to drop out of school and rack up low test scores than their better-off peers, the volume points out. At the postsecondary level, the scholars find, class disparities are widening even as college attendance rises. Nearly three-quarters of students enrolled in top-tier colleges and universities come from families in the highest socioeconomic group. Three percent are from the lowest group. The Brookings scholars explore a variety of strategies for increasing intergenerational mobility. At the preschool level, they write, policymakers get stymied over whether to increase access to preschool for all children or to target more-intensive programs to disadvantaged children. A better idea, the authors say, is to do both. “That way, you’re moving everybody up the ladder, and you’re moving the bottom of the ladder up more steps,” said W. Steven Barnett, who is the director of the National Institute for Early Education Research at Rutgers University, in New Brunswick, N.J., and the co-author of the essay on early-childhood education. After reviewing research on strategies for improving K-12 schools, Princeton University economist Cecelia E. Rouse and her co-author conclude that programs aimed at reducing class sizes and raising the quality of teachers in the schools that poor children attend may be a better bet than school choice programs or measures, such as the federal No Child Left Behind Act, that hold schools accountable for improving students’ test scores. To even the playing field in higher education, policymakers have to pay attention to both preparing precollegiate students to be able to succeed and to increasing public financing of college tuition, argue Robert H. Haveman, a professor of economics and public affairs at the University of Wisconsin-Madison, and Timothy M. Smeeding, a public-policy professor at Syracuse University in Syracuse, N.Y. Colleges can also cut tuition costs, they say, by focusing on their core educational missions and letting others provide services such as room and board. They also call for funneling state aid for higher education directly to students, rather than to institutions. Though education “may be the best escalator we’ve got,” said Christopher S. Jencks, a professor of social policy at Harvard University’s John F. Kennedy School of Government, such solutions to reducing social disparities also raise a lot of questions. “Race and Class: Separate and Not Equal,” September 12, 2006. “The Dropout Crisis Debate,” March 28, 2006. “It’s Time to Focus on the Forgotten Middle,” November 2, 2005. "The whole money thing ... has gotten totally out of hand. I support any restrictions of any kind, and most of the lobby would too," said one lobbyist, who didn't want to be named. Some reformers suggest that Lt. Gov. David Dewhurst, a multimillionaire who can largely fund his own campaigns if necessary, may be receptive to contribution limits because they could partially disarm opponents in a future governor's race. But Dewhurst may not want to fight this uphill battle. "I think that over the last few years, I've been hearing from more people that they're feeling disenfranchised," Gullahorn said. Gullahorn said the Professional Advocacy Association of Texas, an organization of lobbyists he heads, won't take the lead on campaign finance reform but will support efforts to impose contribution limits. He said the group also would support the legalization of direct, but limited, corporate contributions to candidates, a practice now banned by state law. That proposal may spark even more controversy, but Gullahorn said such a law could be easier to administer than the system of political action committees, through which many corporate-related donations are now made. Bob Perry, a Houston home builder, and Leininger, a San Antonio businessman, are among donors now outgunning most traditional givers, including the vast majority of business executives, doctors and plaintiffs lawyers. Perry, who has headed the Texas donors' list for the past three elections, spent $16 million on state and federal races in 2005-06, according to a report by Texans for Public Justice, which tracks money in Texas politics. He gave $6.7 million of the total to state candidates, mostly Republicans, and conservative Texas political committees. Leininger gave about $5 million in pursuit of a law allowing tax dollars to be spent on vouchers for private school tuition. He helped unseat two Republican legislators who voted against him in 2005, but overall lost more races than he won. A handful of other contributors, including plaintiffs lawyers John O'Quinn of Houston and Fred Baron of Dallas, gave about $1 million or more. O'Quinn was Democratic gubernatorial nominee Chris Bell's single biggest contributor. The above unnamed lobbyist believes donation limits will get more support from legislators after the large sums of money that Leininger, in particular, spent against House members who had voted the "wrong" way on vouchers. Look for the latest news in Texas politics each Monday from Austin Bureau Chief Clay Robison. The downloadable report is available here (pdf). Immigration was a heated topic of debate leading up to the November elections and will continue to fuel discussion and action in 2007. This month, I released a special report, "Undocumented Immigrants in Texas: A Financial Analysis of the Impact to the State Budget and Economy," which clearly shows the state receives an economic benefit from the growing number of undocumented immigrants in Texas, but it also sheds light on the challenges facing local governments providing services to undocumented immigrants. The report (online at www.window.state.tx.us) marks the the first time any state has done a comprehensive financial analysis of the effect of undocumented immigrants on its budget and economy, looking at gross state product, revenues generated, taxes paid and the cost of state services. The absence of the estimated 1.4 million undocumented immigrants in Texas in fiscal 2005 would have been a loss to our gross state product of $17.7 billion. Undocumented immigrants produced $1.58 billion in state revenues, which exceeded the $1.16 billion in state services they received. However, local governments bore the burden of $1.44 billion in uncompensated health care and law enforcement costs not paid for by the state. The report estimates that undocumented immigrants in Texas generate more in state taxes and fees than the costs incurred by the state in providing education, health care and emergency medical services, and incarceration. Texas is more likely than other states to capture tax revenues from undocumented immigrants because it has no income tax and relies heavily on consumption taxes. Services for undocumented migrants include K-12 education, emergency medical care, health care for children with special needs, mental health aid, substance abuse aid, immunizations and public health. Undocumented immigrants are not eligible for Medicare, Medicaid, the Children's Health Insurance Program, food stamps, welfare, Supplemental Security Income, public housing, job opportunities for low-income individuals and child care and development. The report estimated the state spent $957 million on K-12 education for undocumented students during the 2004-2005 school year. States may not deny access to public education to immigrant children residing within their boundaries, regardless of legal status. I estimated the state spent $11.2 million for higher education for undocumented students who are classified as Texas residents and thus paid in-state tuition during the 2004-2005 school year. Most of these students attended community colleges. In fiscal 2005, I estimated the state spent $58 million for health care services for undocumented immigrants. Most of the state's costs ($38.7 million) were for emergency Medicaid services, most of which is tied to childbirth. I estimated the state spent $130.6 million on incarceration for undocumented immigrants in fiscal 2006. Local governments and hospitals feel the effect from undocumented immigrants. In 2004, undocumented immigrants cost hospitals an estimated $1.3 billion in uncompensated care, while in 2005 local governments spent $141.9 million to cover costs associated with incarceration. The report estimated undocumented immigrants paid $513 million in fiscal 2005 in local taxes, including city, county and special district sales and property taxes. Revenues from undocumented immigrants exceed what the state spent on services by more than $420 million. Though state revenues exceed expenditures for those immigrants, local governments and hospitals experience the opposite, with the estimated difference being more than $920 million for 2005.